FLUID FILM® is a penetrant and lubricant also used for corrosion prevention. It is a non-toxic, long lasting, thixotropic liquid that has been used for over fifty years in the highly corrosive marine environment of ships and offshore drilling rigs. More recently they have been introduced and successfully utilized in the aerospace, aircraft and automobile industries as well as for home maintenance. Facilities where they are used include the following: government facilities, commercial fishing concerns, gas companies, agriculture, salt plants, municipal plants, power plants, manufacturing plants and pulp and paper mills. 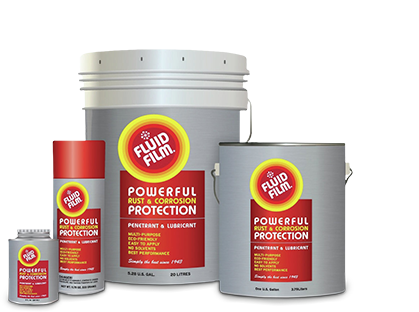 FLUID FILM® is formulated from specially processed wool-wax, highly refined petroleum oils and selected agents to provide corrosion control, penetration, metal wetting and water displacement. The long lasting product contains no solvents, will not dry out and will penetrate to the base of all metals, providing corrosion protection from both natural and industrial atmospheres. Heavily corroded and/or frozen parts such as nuts, bolts, shafts, etc. that would normally be damaged during maintenance, can be salvaged by applying FLUID FILM®. Unless designated otherwise, the following data refers to FLUID FILM® NAS or FLUID FILM® AS after the propellant has evaporated away following spray application. 89% minimum (3 hours @ 220°F). Less than 10 -9 ohm/cm @ 1 mHz. 0.875 - 0.885 (less propellant). None on most painted surfaces. Fail load - 15 pounds. 40 Kg., 1200 RPM for 1 hour @ 167°F. Results: Scar diameter of 0.49mm. Contain no silicones. It is recommended that surfaces treated with FLUID FILM® AS or NAS be hot water or steam detergent washed (120°F), whichever is most effective. Grade 2 -Soft Films. Meets & exceeds salt spray requirements. Displaces water from all metal surfaces (MIL-C-23411,Paragraph 3.6). Non-toxic, LD-50 greater than 3 grams per kilogram. Non-irritating skin response. Very slight irritation to the eyes. (Toxicity tests performed according to standard methods by an independent laboratory). AS: Extremely flammable. Contents under pressure. Do not puncture, incinerate or store above 120°F. Keep from open flame. Turn can upside down, point in a safe direction and spray until only propellant escapes. If spray button becomes clogged during use, pull it from the can and clean it with a fine wire or needle. Replace the button with a gentle twisting motion, keeping it pointed in a safe direction. Do not stick pins or other objects into nozzle tube. All components of FLUID FILM® Aerosol and non-aerosol are listed on the TSCA Inventory.